The Halloween movie franchise started in 1978. It is generally considered the start of the slasher horror movie genre, with its character Michael Myers thus being the ur-mad slasher. As of this writing there are ten films, plus the comics, novels, at least one video game, etc. Known Relatives: Judith Myers (sister, deceased), Laurie (sister), Unnamed father & mother (seen at the beginning after he kills Judith) (probably deceased), Jaime Lloyd (niece), Stephen (great-nephew/possible son). Base Of Operations: Haddonfield, USA. Height: 6’1” Weight: 205 lbs. Michael Myers is the worst type of mad slasher. He’s very intelligent, inhumanly strong, patient, perceptive, stealthy, a quick learner and possesses an indomitable will. He learned to drive just by looking at people driving. Being a real stalker he is an expert at stealth as well as the use of any weapon. He’s also extremely dangerous in hand-to-hand combat versus normal humans. Myers’ biggest strength is probably his extreme persistence. He never ever gives up. He can wait forever before making his move and nobody can be safe as long as he lives. Peculiarly he’s also very fast even though it looks like he’s hardly moving. This often leads to surprises for his intended victims as he suddenly appears before them with a large weapon in his hand. When Michael Myers was 6 years old he killed his own sister with a knife. He did so while clad in a full body suit and a face-covering white mask, during Halloween. The cause of his apparent madness were then unknown. The young boy was institutionalized seemingly for life. The doctors of the sanitarium, particularly Dr. Loomis, put much effort in curing him. But even being able to reach him they completely failed. It was as if he was the devil himself just waiting for something. It was later revealed that Myers’ madness was the result of a ritual by worshippers of an evil Celtic god named Arawn . The spell was part of a ritual where an entire family is sacrificed. But rather than do it themselves, they turn one family member into a lunatic and he kills everyone on his own. 15 years later, at age 21, he escaped the Sanitarium during Halloween. He commandeered a car and begun slashing innocents in his hometown of Haddonfield. He was after his own sister Laurie during that time. However, she kept escaping him. 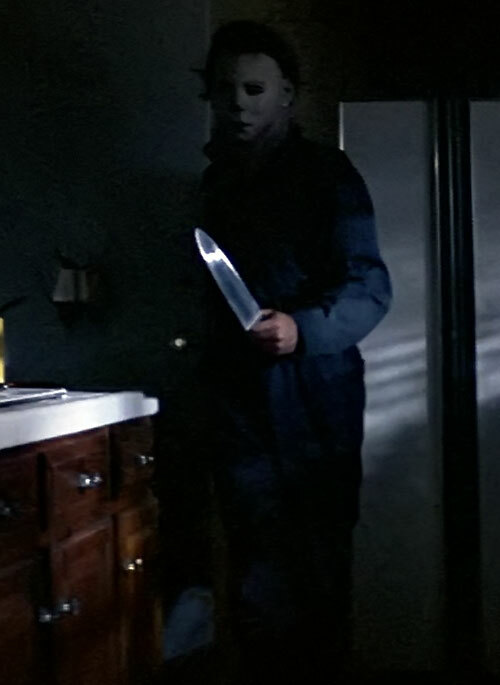 Michael’s killing spree was temporarily ended when Dr. Loomis (convinced of the threat Myers posed, and hunting him) emptied his revolver into his guts (Halloween I). 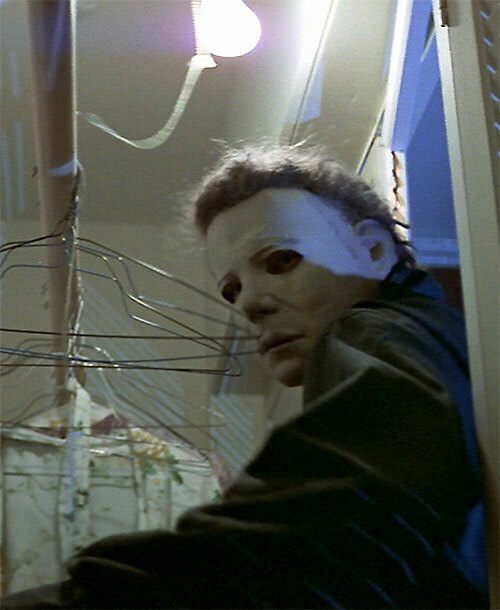 But Myers did get away and returned to kill innocents in Haddonfield during Halloween. 20 years after his first escape Myers returned again, killed several youngsters while hunting Laurie and her kid. But was finally killed by her, getting the peace he never got in life (Halloween 20 Years Later). 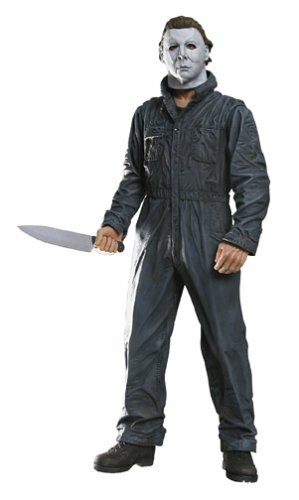 Michael Myers is a evil looking strong, but agile maniac usually clad in a full blue body suit and a white completely face covering Halloween mask. Almost always he carries a melee weapon in his hand stalking innocents. 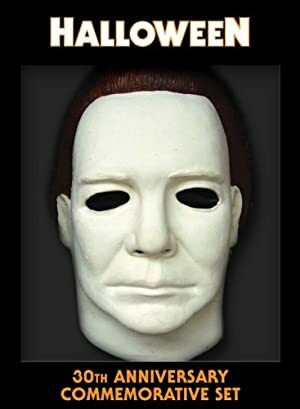 As Myers always is sneaking around very few have ever gotten a clear view of him. Most of those who have died. When he has been seen, however, it is only as a shadow at a distance. Michael always moves slowly (even when running !) and sometimes actually takes his time with his victims. For anyone seeing him he’s extremely scary and most people will flee head over heels in panic to escape (often failing). Michael Myers is an extremely dangerous psychotic killer. For some reason he is forced to kill innocents around the time of Halloween and then preferably by a melee weapon or by his bare hands. It is not known in what manner he chooses his victims, but they are often youngsters and basically innocents. He is also very fond of stalking members of his own family like his still-living sister Laurie. He is terribly intelligent and is usually able to collect data about his victims from a distance so that he can kill them safely with no risk of detection. He apparently enjoys hunting his victims as he sometimes takes time with them instead of finishing them off immediately. Myers also has a peculiar trait as to warn his potential victims by giving away his position by distracting noises. Whether this is to give his opponents a chance to flee as fast as possible (an act of mercy which is very improbable) or just to scare them is not known. Another unusual trait is to sit down a while shaking his head for some seconds after having been hurt by any sort of attack. After that he will again mercilessly stalk his intended victim allowing nothing, nothing to stop him. Whenever Michael Runs it really looks like he’s walking fast. Invulnerability drops to zero if all of Myers relatives are killed. Area Knowledge (Haddonfield), Iron Nerves, Sharp Eye. Minor Irrational Attraction to Causing noise to warn victims, Catastrophic Irrational Attraction to kill innocents during the period of the Halloween Days, Serious Physical Restriction (voluntary mute). Whatever weapon he may find – preferably a melee weapon. By Peter S Piispanen aka The Angel. Source of Character: Halloween movies. Helper(s): Mark A. Ayen, Crinosg, drphibes.